The festive season is just around the corner. 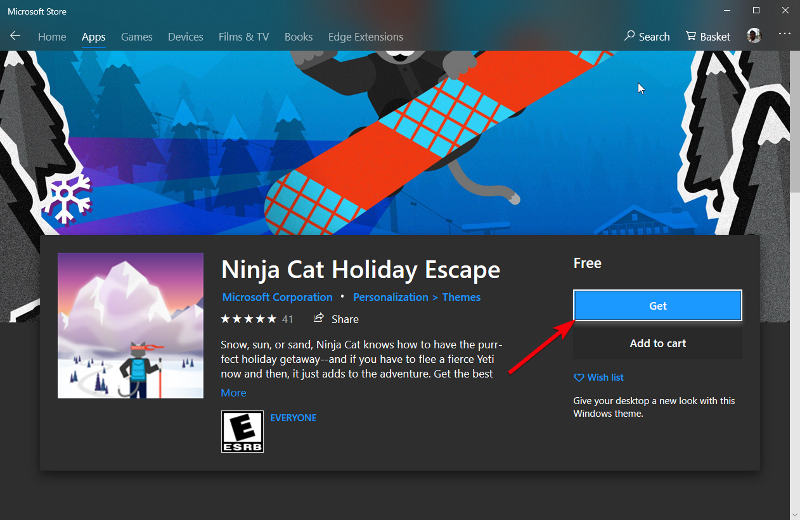 To spice up your holiday, Microsoft released a few best Christmas themes in Windows 10 store. 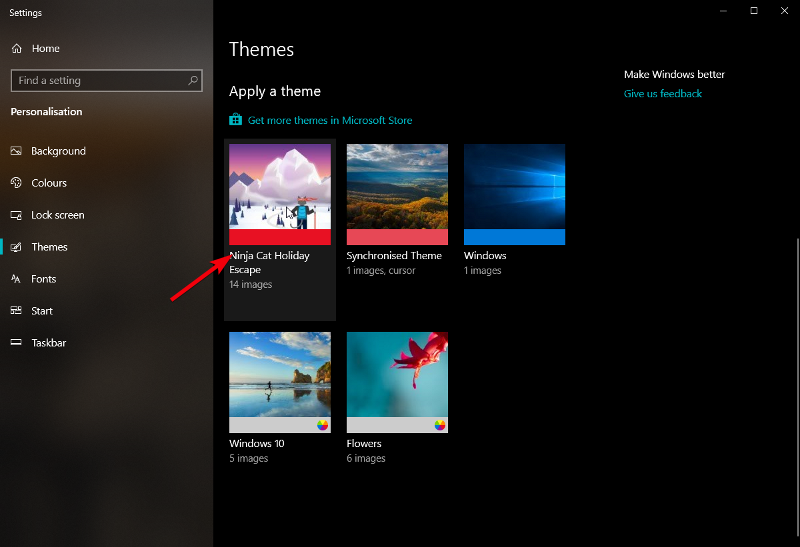 Additionally, there are a few other Windows 10 holiday themes too. The best thing is, you can install any Christmas theme you want from Windows 10 store with just a single click. 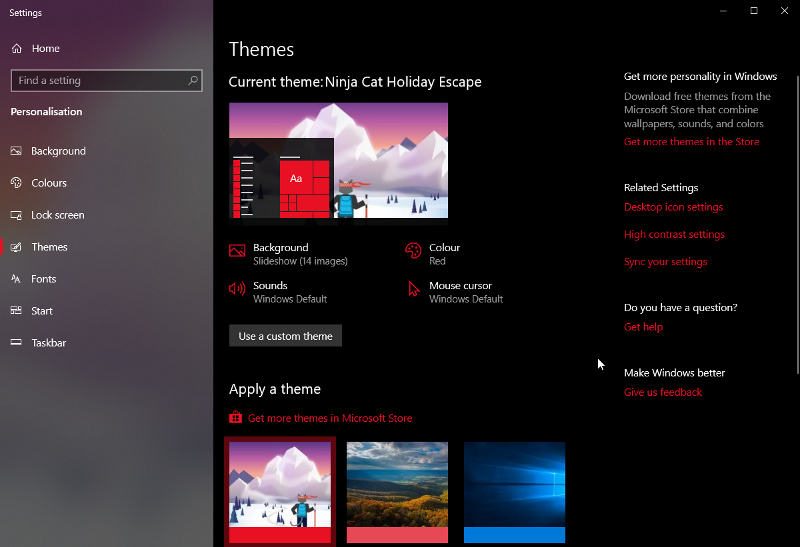 After installing the Christmas theme in Windows 10, you can apply the theme or switch between your favorite themes using the PC settings app. I've added instructions on how to apply any install theme at the bottom section. So, without further ado, here are some of the best Windows 10 Christmas themes. To install the theme, simply follow the link below your favorite theme. Now, click on the "Get" button on the store page. If prompted, click on the button "Open Microsoft Store". This action will open the Microsoft store on your computer. Here, click on the "Get" and then "Install" buttons to install the Windows 10 Christmas theme. Snow, sun, or sand, Ninja Cat knows how to have the purr-fect holiday getaway--and if you must flee a fierce Yeti now and then, it just adds to the adventure. Get the best of Ninja Cat's greatest moves, from dogsled under the northern lights to monster truck across the Outback in Down Under. Peaks glitter under the moon, stars, and Northern Lights. Snowy sweeps reflect sunrise and sunset onto towering cliffs. Take in the views from the warmth of your desktop. Seen from above, below, or across a graceful wing, these 16 images of aircraft will send your imagination on a journey with this free Windows 10 Christmas theme. Take in the vivid beauty of these symbolic flowers with this free, 16-image set for Windows 10 holiday theme. Frozen bubbles, crystalline leaves, and delicate buttercups show off their fragile sparkles in this 20-image set. From adorable snow people families to majestic castles and intricate trains, marvel at the glittering creations in this 14-image set. Cats really are everywhere in this free, 10-set theme for Windows: In the kitchen, in the yard, on the bed, on the mantle. Even in the kitchen sink. Take your coffee with a side of creativity in this free 18-image set for Windows 10 theme. From blue mountains to blueberries, the most calming of colors are all around us. This free, 15-set theme for Windows will show that you don't have to feel sad to be blue. Captured during a summer thaw, these 10 images of frozen water will bring a bit of cooling relief to your desktop. Dividing their time between land and sea, penguins are some of the most involved animal parents. These 18 images of penguin fathers caring for their young. Put 3D snowy scenes, a wintry steampunk village, and even a bear on a Zamboni on your desktop. Artists from Microsoft’s Windows Next team have created this free, 14-image theme. After install the Christmas theme of your choice, you need to manually apply the theme. It is rather easy to apply a theme in Windows 10. In fact, there is a dedicated themes page in the Settings app from where you can see, apply and delete installed themes. 1. First, open the PC settings app by pressing keyboard shortcut Win + I. Now, go to "Personalize" and then "Themes". 2. On the right panel, scroll down to see all the installed themes. Find the theme you want to apply and click on it. In my case, I'm applying the Ninja Cat Holiday Escape theme. 3. As soon as you click on the theme, Windows 10 will apply the theme instantly. If you want to delete a theme, simply right-click on the theme and select the "Delete" option. Hope that helps. If you like this article then do check out how to increase font size in Windows 10. Increasing system-wide font size is quite helpful for daily usability and your eyes will hurt less. This is especially true if you spending a lot of time in front of your computer monitor. Comment below sharing your favorite Christmas themes for Windows 10 or holiday themes for Windows 10.